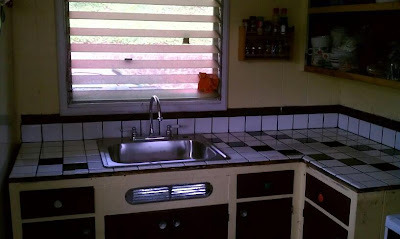 I was just looking through some pictures and realized that I never took a picture of our completed kitchen renovation. This is the last picture I took when the counters were done and the sink was in. We have since painted the cabinets black and white with white ceramic draw pulls. I love the way it came out and it's amazing to think that we did that ourselves. So very exciting. 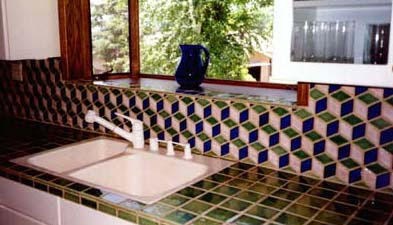 Look at those tiles on the back splash. I love the 3-D effect. I want those tiles or I want to know how to do that. I love looking at kitchens and bathrooms. They have always been my favorite rooms and really the rooms you can do so much with. Living rooms, bedrooms, what can you do with them? Paint. Wall effects? Furniture? That's about it. But with kitchens and bathrooms you can really, truly create something. I love them. When I get to remodel my kitchen completely I want granite counter tops. When I mentioned this to Hubby he said, granite countertops houston, we have a problem. He does not like granite and he does the vast majority of the cooking. Hmmm...I see a problem brewing. But that won't be for a while. I love my kitchen the way it is right now.